The Piratpartiet, or Pirate Party, is a new Swedish political party dedicated to copyright reform, patent law reform, and strengthening personal privacy rights. The party has no stance on any more general issues. Founded earlier this year, the Pirate Party has gained significant attention from both the domestic and international media. While p2p filesharers are clearly a key potential constituency, other issues, such as a desire to reform the pharmaceutical patent system, indicate the party has a notion of the broader implications of the platform (or at least the PR savvy to tap into them). The Pirate Party has a chance (albeit a very, very small chance) of putting a member in Parliament in the September general election. But even if they don't succeed, they have effectivly forced the issue into the general political sphere. Other minor parties have adjusted their platforms to accomodate the Pirate Party's agenda and avoid losing votes. I'll be following the Party's progress this summer with interest. As one might expect, citizens of other filesharing nations have followed suit and started their own Pirate Parties. There are even rumblings of a US version. While I doubt the PPUS will have a significant impact on US policy, I see nothing wrong with the creation of an overtly political organization dedicated to copyright reform. In a recent Slashdot discussion, one commentor noted that the US already has "legitimate organizations" like the EFF working towards these types of goals. But one reply was: Well on the other hand, "Electronic Frontier Foundation" doesn't make headlines. "Pirate Party" does. I know I'll never have a chance to cast a vote for a Pirate, but a group like this has the potential to provoke a broader public debate on IP issues. 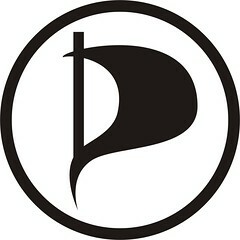 Incidentally, the Pirate Party's logo is really cool. I wanted it on a shirt, but getting an official Tshirt shipped from Sweden would run about US$40. So I grabbed their logo and slapped it on some swag at Cafepress. I'll probably take down my versions once the US Pirate party starts fundraising, but if you'd like a Pirate Party t-shirt, you can grab one there.